Upgrade the power and styling of the Hyundai Genesis 2.0 Turbo by upgrading the factory exhaust system to the Injen Catback Exhaust. The Injen Catback Exhaust for Hyundai Genesis 2.0 increases power while adding a sporty exhaust tone. Upgrading the exhaust system to the Hyunda Genesis 2.0 Turbo is usually one of the first performance modifications made since it's simple to install and produces significant power. 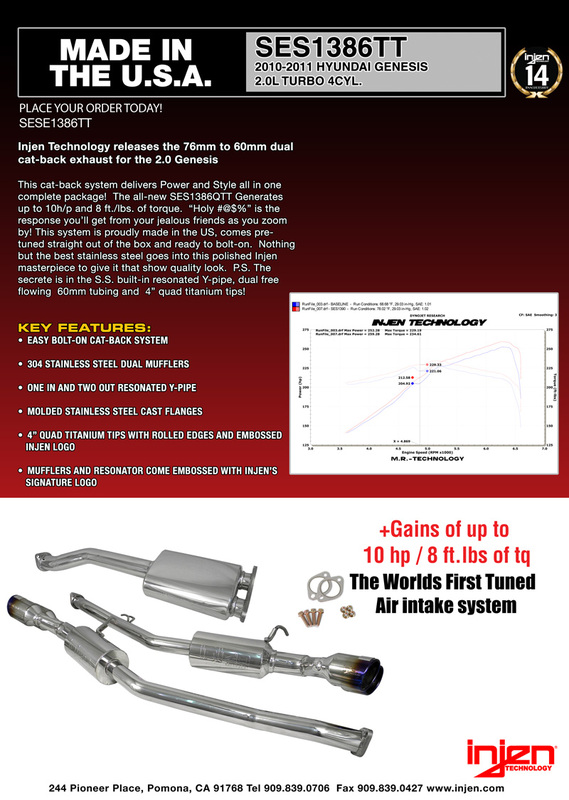 The Injen Catback Exhaust uses larger diameter, stainless steel piping with less restrictive bends to free up exhaust flow, reduce back pressure, and ultimately increase power. Each Injen Catback Exhaust is dyno-tuned to ensure that the Hyundai is achieving maximum power without any compromises in performance or driving comfort. When paired with an Injen Cold Air Intake, the Injen Catback Exhaust for Genesis 2.0 produces 15hp and 26lb/ft torque gains. The Injen exhaust not only adds extra performance to your Hyundai Genesis, but will also add extra styling to your car with its 4" quad titanium tips. All the necessary hardware and instructions are included for installation, and is backed by Injen's limited 1-year warranty. Professional installation recommended. Access to the underside of the vehicle is required.